By default, each page includes a single blank design. If you have Developer privileges or better, you can create new designs. Each page can have an unlimited number of designs. Creating multiple designs allows you to easily explore different ideas, supports multiple workflows, and allows your entire team to use ProtoShare. For example, an end-to-end workflow for a page might include a low-fidelity design, a high-fidelity design, and a design comp. These designs can be created by different stakeholders with distinct skills. Feedback can then be solicited from all project members to produce the best result. All project pages are displayed as an interactive site map. 3. Create the new design. Select File > New Design and specify a name for the design. You can specify a new name or select an existing name from the menu. New designs do not contain content. To add content, open the design in the Editor. Refer to Editing Designs for more information. 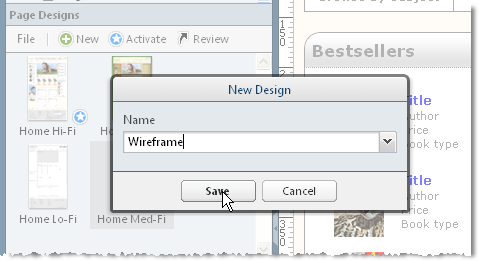 The New Design dialog is shown below.